There's a good reason people over the age of sixty are not donor candidates for bone marrow transplantation. The immune system ages and weakens with time, making the elderly prone to life-threatening infection and other maladies, and a UC San Francisco research team now has discovered a reason why. "We have found the cellular mechanism responsible for the inability of blood-forming cells to maintain blood production over time in an old organism, and have identified molecular defects that could be restored for rejuvenation therapies." 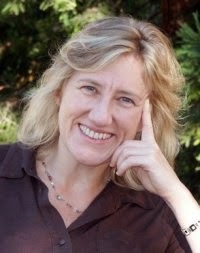 said Emmanuelle Passegué, PhD, a professor of medicine and a member of the Eli and Edythe Broad Center of Regeneration Medicine and Stem Cell Research at UCSF. Passegué, an expert on the stem cells that give rise to the blood and immune system, led a team that published the new findings online July 30, 2014 in the journal Nature. Blood and immune cells are short-lived, and unlike most tissues, must be constantly replenished. The cells that must keep producing them throughout a lifetime are called hematopoietic stem cells. Through cycles of cell division these stem cells preserve their own numbers and generate the daughter cells that give rise to replacement blood and immune cells. 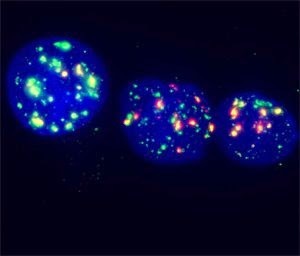 But the hematopoietic stem cells falter with age, because they lose the ability to replicate their DNA accurately and efficiently during cell division, Passegué's lab team determined. Molecular tags of DNA damage are highlighted in green in blood-forming stem cells. 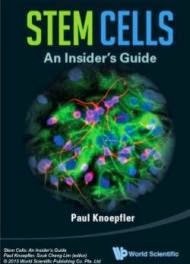 "Old stem cells are not just sitting there with damaged DNA ready to develop cancer, as it has long been postulated." said Passegué. But not all was well in the old, surviving stem cells. The molecular tags accumulated on genes needed to make the cellular factories known as ribosomes. The ribosomes make all the cell's proteins. Passegué will further explore the consequences of reduced protein production as part of her ongoing research. "Everybody talks about healthier aging. The decline of stem-cell function is a big part of age-related problems. Achieving longer lives relies in part on achieving a better understanding of why stem cells are not able to maintain optimal functioning." Passegué added. Passegué hopes that it might be possible to prevent declining stem-cell populations by developing a drug to prevent the loss of the helicase components needed to faithfully unwind and replicate DNA, thereby avoiding immune-system failure. Among the additional study authors are graduate student Johanna Flach and postdoctoral fellow Sietske Bakker, PhD, who performed the experiments in Passegué's lab at the Eli and Edythe Broad Center of Regeneration Medicine and Stem Cell Research at UCSF. International collaborators included Juan Méndez, PhD, of the Spanish National Cancer Research Center, in Madrid, and Ciaran Morrison, PhD, of the National University of Ireland, in Galway. The study was funded by the California Institute for Regenerative Medicine and the National Institutes of Health.